After writing and directing indie films like Babagwa, Astro Mayabang, and more recently, the Derek Ramsay-Solenn Heussaff starrer Love is Blind, director John Paul Laxamana takes on his first Star Cinema project in the rom-com The Third Party. "I think na-notice nila yung Love is Blind yung isang pelikula ko before this. In-offer sa akin ito and siguro nakita since sa independent films medyo alternative yung atake ko and yung topic nain medyo alternative din hindi usually mainstream, medyo merong edginess kasi may LGBT angle kaya siguro nila ako tinap for this,” he shared during the The Third Party presscon held last September 28 inside the ABS-CBN compound. In his latest movie, Angel Locsin plays the role of a woman who gets in contact with her ex-boyfriend Sam Milby who is now in a relationship with Zanjoe Marudo. Working with these stars was quite an experience for the young director. "Siyempre na-star struck pa rin ako sa mga artista ko until now. Growing up nakikita ko sila sa TV. Star struck ako pero I made it clear to myself that as their director I have to step up para sundin nila ako.So good thing na hindi naman nila ako binu-bully. I can feel their trust naman,” he admitted. Direk John Paul said he wants The Third Party to be pegged as a LGBT movie. "I don’t want it to be a typical kabit movie kaya light yung pinili naming treatment and then sa LGBT angle naman ayokong mag-call attention sa pagiging LGBT niya mas tungkol siya sa relationship nilang tatlo, as friends, as mag-ex. Yun yung focus niya eh. Tapos light lang talaga yung gusto namin na atake para entertaining pa rin siya,” he said. 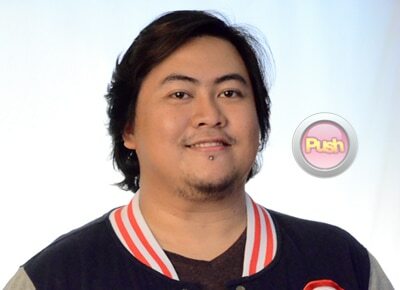 Working with Star Cinema for the first time was not hard a change for direk John Paul. "I think yung storytelling itself universal naman yan. It’s just that for mainstream and a company like Star Cinema I had to align my goals with the goals of the company so of course nag-adjust ako. Siguro unlike other independent filmmakers na nag-cross over sa mainstream hindi naman ako na-disillusion. Kumbaga I was enjoying the process. Na-enjoy ko yung learning process sa project naming ito. Ito kasi yung first film ko na hindi ako yung nagsulat so inenjoy ko lang din yung process na mag-interpret ng script na sinulat ng iba and so far so good,” he added. When it comes to his directing style, John Paul said it was not difficult to get the best out of his stars Angel, Sam, and Zanjoe. "Ako kasi more of telling my actors what I really, really want and what I think the audience will react to, what they should feel. So as actors I’m sure alam na nila yun. So dini-discuss ko lang talaga ng very specific yung instructions ko. It all boils down sa audience perception ko, kung magugustuhan ito ng nakararaming tao yun yung pinaka-highest goal ko sa mga pelikula ko, indie man o mainstream,” he added.